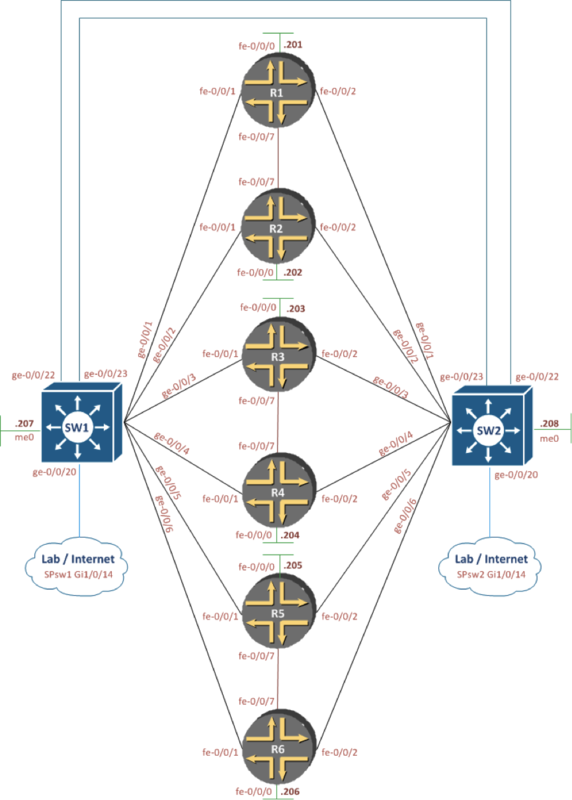 As I’m preparing for the various exams (up to the Expert lab) of the Enterprise Routing & Switching track of Juniper I needed a lab to support this. In this blogpost I would like to explain my choice of hardware and software and how I’m going to use this set-up to prepare for the written exams and the lab exam. Based on the blueprint, available on the Juniper website (http://www.juniper.net/us/en/training/certification/resources_jncieent.html), I needed to select hardware and software. The current software version used in the lab is JUNOS 10.4. On the various communities I heard that they want to upgrade this to a JUNOS 11.x (probably 11.4, which is a long-term-support version) software track somewhere this year, but until that time I chose the latest version of 10.4. At time of this writing this is JUNOS 10.4R9. On the official blueprint there is no real indication of which hardware is used on the lab exam, but when you find your ways through the community sites and with the help from some community friends (special thanks to Chris 😉 I decided to use the SRX100H as router and EX4200 as L3 switch. For the switching layer I chose the EX4200 as virtual chassis technology is on the blueprint and the only 1G fixed switch supporting this is the EX4200. I chose the smallest model offering 24 GigE ports of which 8 are PoE enabled. The EX4200 is a full layer 3 switch and even capable of some MPLS features. As the number of routers and switches is unknown (and under NDA of course) I chose a set-up in which I can practice anything. This means that I can do anything with two EX4200s as you can disable the virtual-chassis ports on the back from CLI. Therefore I can use the switches individually when this is necessary to practice for example spanning-tree stuff. The number of routers I chose six. You should be able to practice all kinds of routing and multicast stuff with 4 routers, but you also need backbone devices to inject routes or to act as multicast receiver or source. This is also a reason why I chose the high memory version of the SRX100, to ensure there is enough memory for multiple virtual-routers (routing-instances) with large routing tables. According to the Juniper specifications the SRX100 should only be capable of running 3 virtual-routers, but I already tested up to 10, so I guess this should run up to the memory is full as there is no fixed limitation. Same accounts for other ‘advanced’ features like BGP. On other SRX devices you need to have a license to support stuff like Route Reflection, but on the SRX100H this seems to work flawlessly! One feature that isn’t available on the SRX100H is logical-systems. This is a way to spawn a new routing protocol daemon and therefore a separate configuration file and run multiple truly separated routers. Unfurtunately the branch SRX doesn’t support this, but I’m in the luxury position of also having two packed MX480 routers in my lab as well :). Below is a picture of the physical lab set-up. I have the advantage that I can use the lab facilities of my employer, but this set-up is actually pretty silent. The SRX’s have external power supplies, the EX are the noisiest, but also pretty good to handle in a house environment when only used for labs. Now the big advantage of the SRX100 is that the rack mount kit (separate item to order) can hold two units including a special space for the external power supply. I think this is very nicely done which creates an ultimate lab set-up experience. On the SRX all the connections including console are made on the front, so access to the back is not necessary. The EX switches however have console and management Ethernet ports on the back, including the virtual chassis ports (VCP). Although now shown on the picture, I connected the virtual chassis ports so I can practice virtual chassis technology. During the real lab you will have more switches, but for a practice lab you just need to practice how virtual chassis works and how multi-chassis LAGs and stuff work. After you practiced that you can disable the VCP ports using CLI commands and use the switches independently. Now a tough part of the studying, especially lab exercises, is finding the right study materials. The only official Juniper training material is based on instructor-led courses. You require multiple courses to cover all material of a certain exam. Now you are able to order the books of these courses online, but there is no option to rent the lab environment used in those books. Now you do get the lab guides with those print-outs of the courses, so together with this SRX and EX topology you should be able to do all the labs that are taught in the courses, which might require some re-cabling, but on the other hand, as you will see below, my set-up offers a lot of virtualization options that you can use to create your own logical topology based on this single physical topology. These kinds of set-ups are usually used in labs that are offered for rent, as you don’t want to be re-cabling your lab every time, especially not when it’s hosted overseas :-). The first three are written exams that can be taken at Prometric testing centers around the world. 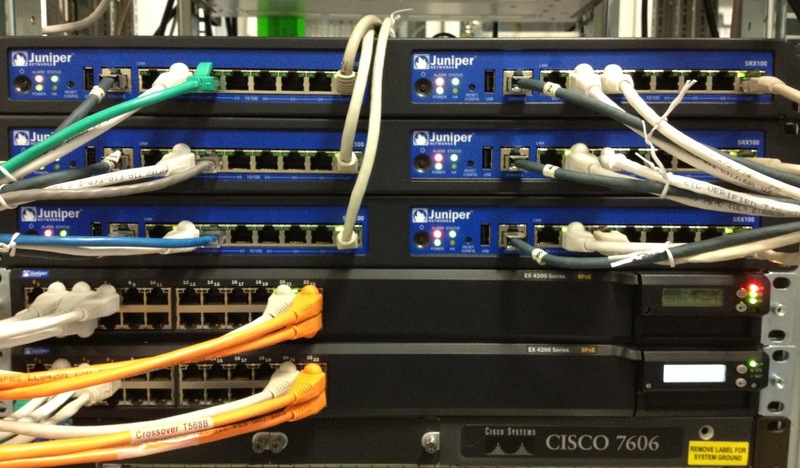 The last exam (JNCIE-ENT) is a 8-hour proctored lab exam that is available at a few Juniper offices around the world. Now especially for the JNCIP-ENT and JNCIE-ENT you will need a lot of CLI experience and will need to do hands-on labs! Even though the JNCIP-ENT exam is a written test, you will be exposed to a lot of show and configuration outputs from the CLI where you will need to identify what’s wrong/correct/configured/etc. Therefore you really need a lot of exposure to the CLI and all of the possible quirks. Although my experience with Juniper exams is that they are straightforward and will not test you about exotic features, but really want you to know what is used in day-to-day networks and what you will see when working with this equipment in the Enterprise environment. There is one company that offers custom JNCIE training. Proteus Networks (http://www.proteus.net) offers excellent boot camps and labs! I already used their proctored practice labs for my JNCIP-M and JNCIE-M lab and I really had a lot of advantages by doing them, so knowing what to expect on the lab was a huge advantage. Currently they only offer remote proctored labs and a self-paced workbook for the JNCIE-SP exam, but they confirmed the same offering would become available for JNCIE-ENT very soon (2012)! For the written exams I will use the O’Reilly books and will practice all the technologies on my practice rack by just testing them out. This should prepare you more than enough to pass them. The combined use of the O’Reilly books and the soon-to-be-released self-paced and proctored labs of Proteus will prepare you well enough for the JNCIE-ENT lab exam! Or in the meanwhile use the labs from the instructor-led courses offered by Juniper or when you are creative yourself, just create labs yourself by coming up with a decent logical topology and by testing the more exotic features like multicast. This is my primary source for asking questions. Quite some Juniper employees are very active on these forums. You can subscribe to them and receive e-mails once replies are available. Very new, but very promising! As I don’t want to be re-cabling my lab when I’m doing exercises I came up with a topology that offers me a lot of flexibility in creating all the logical topologies I need. Therefore I connected a cable from every router to both switches. Interface 1 on each router connects to switch 1 where the port number corresponds to the router number. Interface 2 on each router connects to switch 2. Additionally I connected two routers to each other to test both interlinks between routers and test clustering (not a blueprint item for the –ENT track) functionality of the SRX. As I don’t want to use the console port all the time, but just have an SSH session to my devices, I use a dedicated interface on every device connected to a third switch that is solely used for access to the rest of the network and also connecting to the internet. To ensure the management access (and required interface and routing configuration) does not interfere with the rest of the configuration of the devices I created a virtual-router routing-instance on each device to have the management routing configuration separated from the global routing table. This connectivity ensures flexibility as ports on the switch can be configured either as access, trunk or routed. So depending on the lab exercise that I want to do I will configure either one IP address on the interface, or tagged sub-interfaces on the routers. Therefore I’m able to create tons of interfaces, whenever necessary. When configuring routing-instances, it is possible to connect only the sub-interface to the instance/system, so this also doesn’t require additional physical interfaces to be used. One important thing configuration wise to not forget is by enabling packet-mode forwarding on the SRX devices. Within the exams and labs the SRX is used as an enterprise router instead of a security device, so the default flow-mode should be disabled. I hope I was able to give you an insight in how I built my JNCIE-ENT lab set-up and how I’m going to prepare for the written and practical exam(s). If you have any questions please don’t hesitate to comment on this post or ask questions on the community websites that I tipped in an earlier paragraph. You will find me being active on those community websites as well! Finally I wish you the best of luck in all of your current and future endeavors! Nice write up Rik – answered many questions i have about going/studying for the Juniper exams. Thanks for the positive feedback about our offerings and the help that we could provide along the M series certification track. We are very excited about our ENT offerings for a preparation workbook and remote proctored lab that will soon be available (VERY EARLY Q2)! You can also see if you can add some basic EX 3200/2200. It’s cheaper and you don’t have to “break” the Virtual Chassis to test the STP/RSTP stuff. These low ends also support Q-in-Q as well so it will be a good mix to add to your lab to give you what you “might” see in the lab. As for Proteus, I bought the JNCIE-SP workbook and was not impressed by it at all. I would recommend checking out inet zero’s lab if that helps. Good thought about adding 2200/3200s for multiple switches! I suggest for anybody else looking at this that you get the SRX210 as a minimum. The gigabit ports allow you to use flexible-ethernet-services encapsulation which is especially important for the JNCIE-SP. For SP I would always recommend an MX5. You really need an MX to prepare well for SP. I agree that the 210 with GigE ports is better than the 100, but for ENT you don’t need it. I work for a Juniper Elite partner so we bought it through a channel. On ebay the small SRXes are well priced usually! Nice Write up. Any update News? Almost been a year since you put this together. This url is not accessible, what’s the books that you suggest? Thanks. They cover a lot of technologies. Other good tools are the workbooks from iNET Zero (www.inetzero.com). I got recent original JNCIE-ENT Bootcamp book set (paper), if anyone is preparing for the lab exam and needs them please contact [email protected].